The EEC MINI PLANT STP system is based on the EEC High-Speed Bio-Tec biodegradation and sedimentation technology, which is unique due to its compactness and performance in respect of volumetric efficiency. 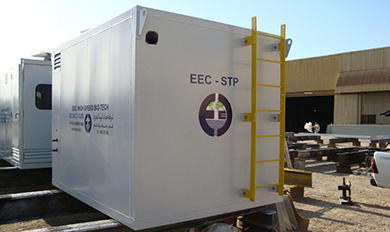 These technologies are combined in a prefabricated; skid mounted and the standardized tank system forming the EEC High-Speed Bio Tec Mini Plants for treatment applications. EEC MINI PLANTS offers three standard models from 6, 20 and 30 m3/day. These systems include sludge, buffer, and feed tank. All EEC systems are extensively aerated and produce no odor. We have incorporated several world-class renowned equipment/instruments, which are time-tested, both at home & abroad. An utmost care has been taken for selection of proper materials in the construction of each component in our package plant system, as we believe that appropriate selection of materials is vital in such an advanced system. 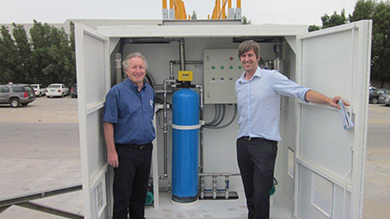 MBBR wastewater plants are very compact & occupy less space than other sewerage treatment plants. Less maintenance, low capital & operating cost benefits simple assembly and operated by on site labor. The system is prefabricated with buffer, feed, and sludge system, all in one system. Easily expandable and transportable to any location. There is no need to add micro organism. The system will operate without any chemical addition. Easy start up, fully automatic operation, reliable & robust once started. One central control panel for easy operation. Clog free air distribution system and AMB bio media that comes with 20 years warranty. Ammonia and nutrient removal systems available upon request. 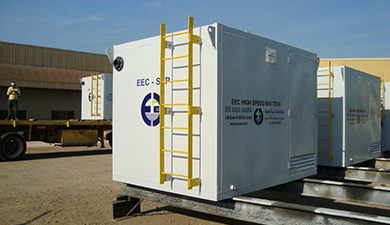 The EEC MINI STP system is manufactured in various lengths in order to suit any particular need. The basic EEC Mini systems has six chambers; buffer, sludge, feed, bio, bio, settling followed by media filter and UV light for final sterilization and have the following nominal capacities with an effluent of 10 ppm BOD as daily average. EEC’s MBBR & MBR wastewater plants have top contribution in military camps or areas.